We had a bumper crop of potatoes last year. After freezing them (as fries, casseroles, etc), canning some, and giving over 200 lbs away, we needed a reliable way to store the rest. 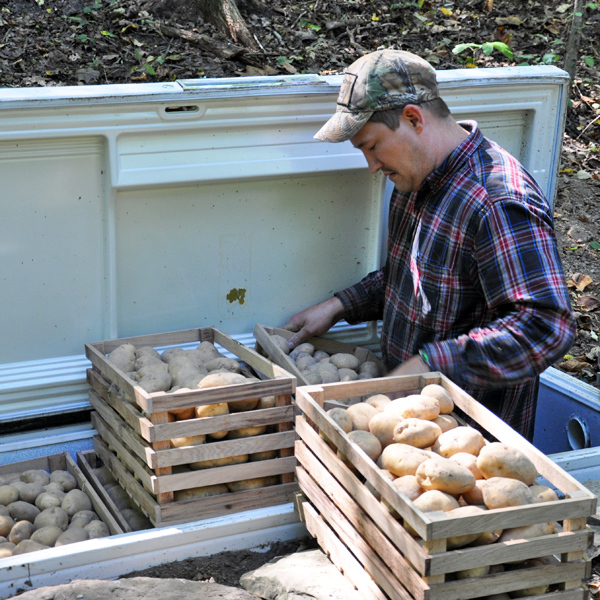 The goal was to have enough potatoes stored to take us through to the next harvest…and possibly never to have to buy potatoes again. 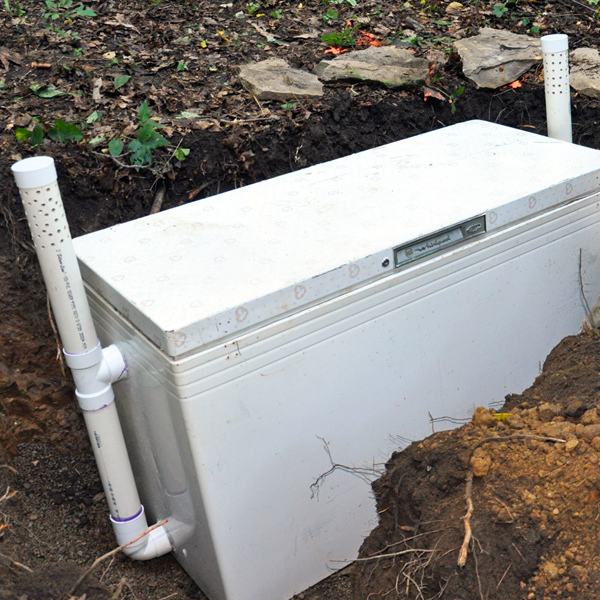 We didn’t have a basement or root cellar (or time/funds to build a full-blown root cellar), so we had to get creative. 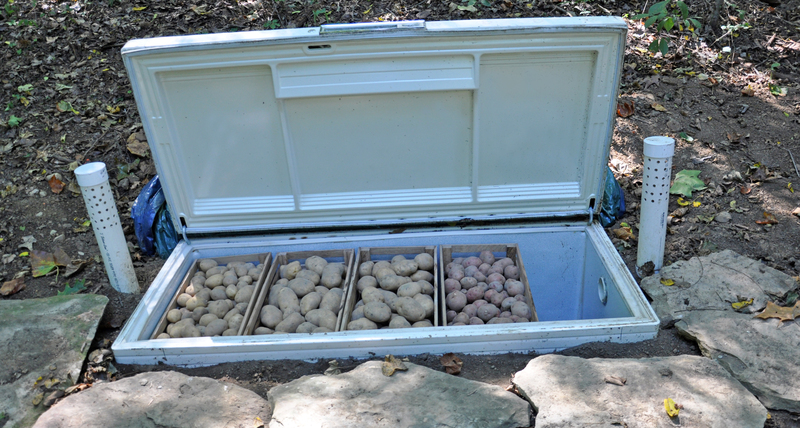 Clyde remembered his dad talking about burying old chest freezers for overwintering vegetables and we decided to give it a try. His sister’s freezer had recently died and so was recruited for the job. Clyde removed all of the working parts and cut two holes in each side. (Note: if your appliance still contains freon, certified individuals can be hired for freon removal or these services may be available at area junk yards or recycling centers.) To the holes he attached PVC pipe for air circulation. When in the ground, it looked like someone had buried a semi. A tarp was partly buried as well in order to protect the freezer and allow easier access during icy conditions. We later added a sheet of insulation under the tarp as well. Clyde made crates for easier storage and better air circulation.With hopeful trepidation, we packed away our harvest. We were careful to store only the best potatoes and packed the smaller ones in the upper boxes so we’d use them first. I’m pleased to report that our deep-freeze root cellar had great results! Mid-winter the potatoes looked just as we’d left them. In early spring only a little bit of sprouting had occurred. Later in the spring we sorted through some of the more deteriorated ones to use as seed potatoes for this year’s crop. Now, in late June, they are not as attractive out of the box, but most still scrub up well, are quite firm and have a good taste and texture. Although a true root cellar is still on the wish list, it’s nice to find an easy, inexpensive solution that works so well. This post is part of Homestead Revival’s Homestead Barn Hop. Check out the rest of the great homesteady ideas and information by following the link!